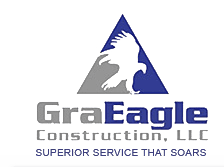 Mold Remediation in Las Vegas - GraEagle Construction, LLC. Mold is a nuisance and can be a health hazard if left untreated. Don’t leave your home and your family at risk. Come to GraEagle Construction, LLC, for mold remediation. We are based in Las Vegas, NV, and service the surrounding areas. Any home can end up with mold, particularly after a flood or pipe leak. Mold grows quickly, spreading throughout your home if left to its own devices. As mold spreads, it creates spores that can irritate you and cause allergies to flare up. Depending on your health and the type of mold, sometimes these spores can cause more severe health concerns. If your home has mold, you may qualify for insurance restoration. We provide the mold remediation services for insurance restoration claims and ensure that your home is free from mold, now and looking forward. Mold remediation is sometimes called mold removal. We do more than provide cleaning that addresses the basic level of mold — we offer deep and comprehensive mold remediation to rid your home of every trace of mold. Our services prioritize your comfort and well-being. We work to swiftly remove any and all mold from your home so that you can breathe easier and quickly recover the comfort that your home should always provide. Since 2001, we have specialized in the insurance repair field, including mold remediation. In those years, we have grown from 7 employees to 40. Our growth is due to our vigilance and commitment to our customers, people like you. We value our relationship with the people that we serve, which is why we coordinate all of our mold remediation work with you. Come to GraEagle Construction, LLC, in Las Vegas for all your mold remediation needs. Complete our online form to request an estimate for our services.